It has become impossible to find any stretch of road that doesn't exemplify the free-fall death of trees. In a way, it's easy to understand why people aren't frantic about dying trees. 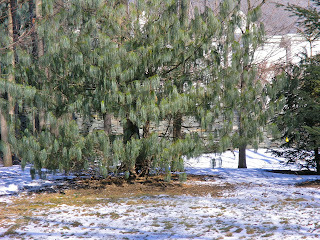 The pines, for instance, are camouflaged. 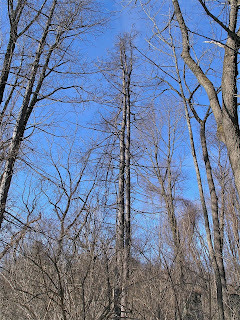 So many are devoid of any needles, they masquerade as deciduous trees. Although actually, they are dead. 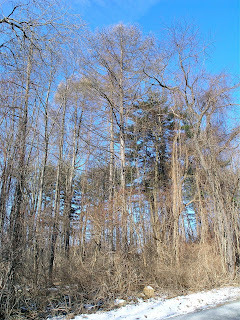 The tree smack in the center of this photo is a pine without any needles. 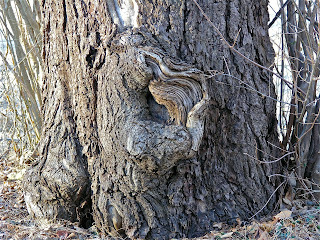 Here is yet another example, a few feet along the road. Even those that retain needles look frozen, like cadavers. Newly planted nursery stock are succumbing to toxic gases at the same devastating rate as older specimens. 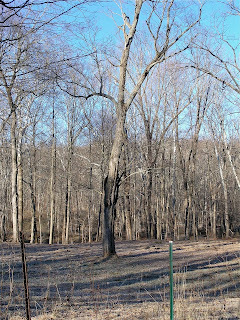 Here are old, established trees. 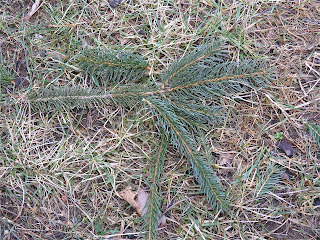 The conifer on the right has no needles left whatsoever, and the conifer on the left is thin and will soon match its neighbor. 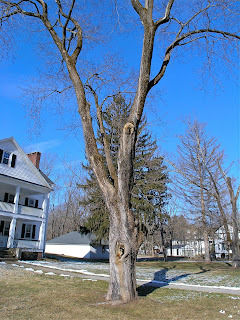 In front of them is a deciduous tree, also exhibiting signs of imminent death - holes, lost bark, absent terminal growth. I don't know what it's going to take for people to recognize the carnage that surrounds them. 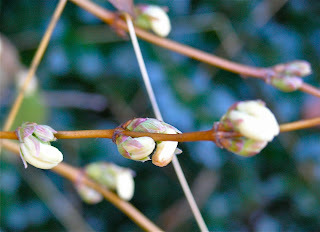 It is likely to be a very interesting spring! This video, which has lovely footage and music, was actually produced in Greece. 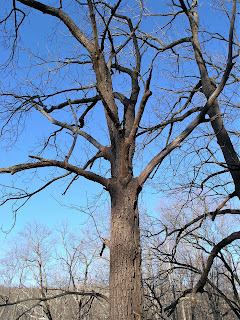 lost trees,ghost trees,dead trees from DaphneK on Vimeo. Isn't this a lovely photo of first daughter? GQ has an article about cell phone and tower electromagnetic radiation, that raises very interesting questions. One is, why are Americans so peculiarly blind to the consequences of their actions and insistent upon putting instant gratification above all else? It's pretty clear from research from other countries, and independent research that ISN'T funded by the very industries making astronomical profits, that the radiation from phones and towers is extremely dangerous for humans. The catalog of suppression of unbiased research fits the same pattern of repression about climate change science, and also closely parallels the intimidation of foresters who would corollate the consequences of pollution on trees, not to mention how the GWB administration de-funded the satellite that could accurately measure global warming! And so another interesting question is, if it's true that radiation is disruptive to the electrical impulses at the cellular level in human brains, what might it be doing to vegetation? Something, after all, has caused trees and shrubs and even annual plants to take a relative recent rapid nosedive, and cell phones and towers are a relatively recent introduction. "A human being is a complex organization of electrical fields. Electroencephalograms and electrocardiograms, for example, measure these fields. Every cell has an electrical field across the cell membrane, which is a regulatory interface and controls what goes into and out of the cell. All nerve signals are electric. And between the nucleus and the membrane there is an electrical field, you can measure voltages of individual cells! Electricity drives biology. We evolved in a particular electromagnetic environment"—the magnetic fields from the earth's iron core, the terrestrial magnetism from lodestones, visible light, ultraviolet frequencies, lightning—"and if we change that environment as we have, we either adapt or we have trouble." Talk about unintended consequences! Even the mainstream media can't ignore that fact that melting ice leads inevitably to bending of the earth's crust and what does that mean??? EARTHQUAKES. Yesterday I had a conversation with a delightful woman who grew up in Central America in what we Westerners would consider poverty, a condition that has made her wiser than many more privileged academics and scientists. I had been speculating that a truism I had long recognized, that nature abhors a vacuum, applies equally well to an individual as it does to nature, and the entire global ecological equation. And we somehow managed even with a language barrier to agree that when it comes to humans, no matter how much money you have, it's never enough. No matter how much storage space you have, you will fill it up and need more. No matter how easy your chores are, you will have to make your standards higher and your chores will fill up your time and become more onerous. This is the delight and the doom of our species. We are never content, nothing is ever sufficient. We strive to improve, to excel, to perform. And therein lies our demise. We have no built-in understanding that there are any limits, and so we surpass those limits, until we consume everything, and there is nothing left. Along these lines is the Doomer Report blog, the extremely well-written ruminations of a Singularitarian. It's quite refreshing to come across the articulation of ideas that consume my thoughts, when most people it seems are content to consume and think solely of their next item of consumption. Among other ironies is the notion that the science has become so advanced, and our technology so complex and inventive, just along as it is about to be the end of all science, technology and perhaps an overwhelming proportion of life. 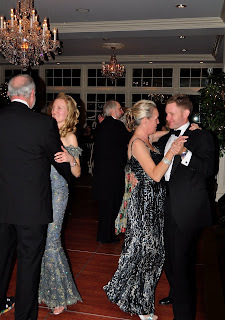 It's been such a lovely party lately, so sad...must it come to an ignominious, faltering end? Thanks to RPauli for so many of these links, including this one, that chronicles the progression from glimmering to enlightenment, through denial and despair, to invigorated activism. Hey, the kids get it! More on schools going green is found here. "I am the Lorax. I speak for the trees. I speak for the trees for the trees have no tongues." This half-hour video of the Dr. Suess book is from a 1972 television special - work is progressing on a new 3-D, computer animated version to be released in 2012. At the rate trees are already dying worldwide, from ozone, and clear cutting, it will be more like a memorial tribute than this cautionary tale. (I can't get the embed to work, to watch, click here. Thanks to Climate Progress where I first saw this. Get Settled with some Popcorn! 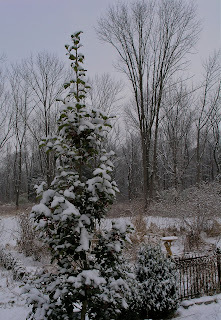 This morning when I woke up a thick heavy snow was falling. 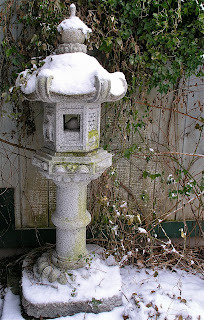 The autumn clematis behind the lantern still has green leaves. 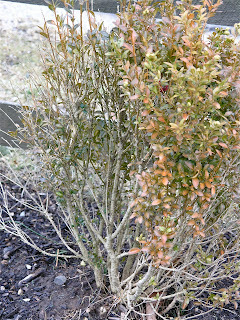 This holly was planted about 10 years ago and has always been disappointingly spindly. 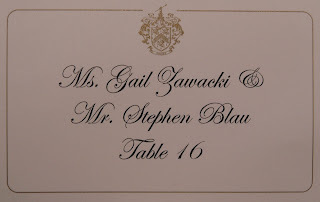 I had blamed the lawn service for weedwacking the trunk. 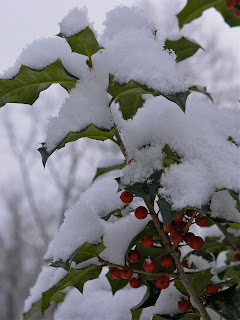 It has never had so many berries and looked beautiful covered in snow. Of course many leaves have the discoloration you would expect from toxic atmospheric gases. Now, not one but two videos. Click here for a compelling comparison of glaciers over time (found at DesdemonaDespair). It has excellent photos and interviews with experienced glaciologists that will make 2035 and 2350 be trivially distinct. Next is the story of geneticists gone wild, narrated by David Suzuki who, I just realized, is a climate hero. It's a bit slow at the beginning (and you should don your tin foil hat first) but it's worth getting through because there is some pretty solid footage of the scale of corporate malfeasance and the mind-boggling profits to be realized. "Deer, elk and even raccoons have a new type of predator to worry about: Poachers who kill increasingly for the thrill of it. Scott Talbott, an assistant division chief with Wyoming's Fish and Game Department, calls it "wanton destruction" that goes beyond shooting. Poachers run down deer with cars or snowmobiles, and chase raccoons, then beat them to death with clubs. They also shoot deer, elk and antelope, sometimes removing valuable antlers but often leaving the carcass to rot on the ground, Talbott and other wildlife officials said. "It's thrill killing — people just going out and killing stuff," Talbott said. "We have seen a significant increase of that in Wyoming. It's disturbing." "The thrill killing usually involves youths ages 14 to 23, who gather in groups with the intent of killing as many animals as possible, said Chuck Horn of the Wisconsin Department of Natural Resources." Thank goodness they're doing a study on it! Here is a poll indicating that more Americans than ever are convinced that global warming will not have any negative effects on them! I suppose it really shouldn't be surprising. The more obvious it becomes, the more frightening it is, and the more people will stick their ostrich heads in the sand to ignore it, or laugh like idiotic ninnies when the President mentions the overwhelming evidence of climate change. This, in spite of the fact that the last time CO2 levels in the atmosphere were this high was FIFTEEN MILLION YEARS AGO! Only look at the article if you can bear to learn what temperatures and sea levels were that long ago. I would amend the conclusions of this video to say, we don't have to wait any 50 years to see the effects of ozone! Unfortunately, this link expired and the video is difficult to embed, so here is a link to the National Geographic film about the ongoing experiments studying the effects of CO2 and ozone on trees. It seems very premature to say things like elevated CO2 is good for plants - like an "all-you-can-eat buffet." What has that sort of overindulgent diet done for the health of the average American? Since the trees and plants evolved to live in the atmosphere with pre-industrial levels of CO2, it strikes me as simple logic that higher levels will ultimately damage vegetation. Nobody knows that leaves that are slightly larger and grow slightly faster will contain the same nutrient levels, or whether trees will produce nuts and fruit with sufficient minerals and vitamins required by the animals that feed on them, for instance. In any event the looming crisis from ozone damage (and quite possibly worse effects from burning ethanol, which as far as I can tell aren't included in this study, nor for that matter is the serious effect of acid rain depletion of essential soil nutrients) is much more urgent than the question of CO2 effects. 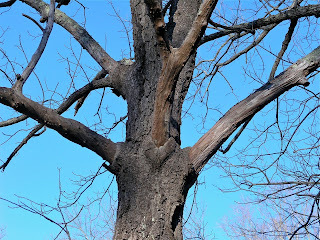 A most important finding is the subsequent vulnerability of trees exposed to ozone to secondary insect and disease, the "sharks smelling the blood." 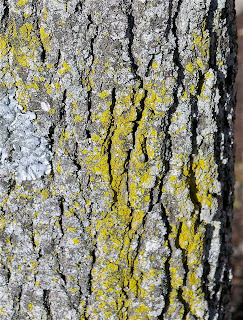 It's time for those researching the pine bark beetle, sudden oak death ostensibly from a fungus, sudden aspen decline, etc., to make the link between ozone exposure and compromised immune systems. Let's hope these scientists will have the courage to make a correlation between their controlled studies in Wisconsin and what is happening in the dangerous uncontrolled experiments going on in our woods, parks, back yards, and farms. Our government agencies and elected officials must become aware that we are threatening not just trees but our food supply with our reckless polluting through toxic greenhouse gas emissions. As far as I'm concerned, this evidence is conclusive enough to be the basis for a lawsuit against big, lying corporations. In spite of all my misgivings about the trajectory of our planet's health, for us, and for other species, I was bouyed and ecstatic to see the buds swelling on this witch hazel. I planted it a couple of years ago, in the wrong spot, prominently center front of the porch - because it quickly grew into an unsightly weedy vine that has forced me to prune it ruthlessly, an activity that I find demoralizing. But oh the scent, I can't wait! It has miniscule blossoms, but they exude a delectable, intoxicating perfume that pervades every molecule of air over an incredible range. Of course, it is too ridiculously early for it to bloom. 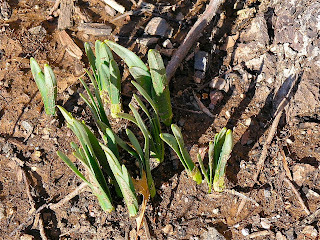 I already mentioned I had found daffodils in December, that are still growing. 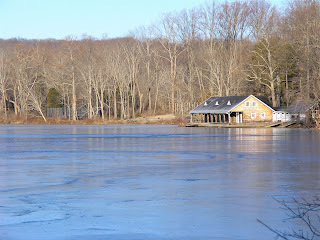 Those are in Peapack Park. Today, at the Dillon Library in Bedminster, I discovered more. They are growing robustly at the base of an ornamental pear, which has bark that is indicative of decline. The UK Guardian has a story about the production of ethanol. The story is about the transition of farm production from food to corn, and whether that impacts the price of food. But I think it's fascinating because of the question of emissions, as the article makes clear the vast and rapid rise in production and mandated burning of ethanol to fuel cars and trucks. "The 2009 figures from the US Department of Agriculture shows ethanol production rising to record levels driven by farm subsidies and laws which require vehicles to use increasing amounts of biofuels. 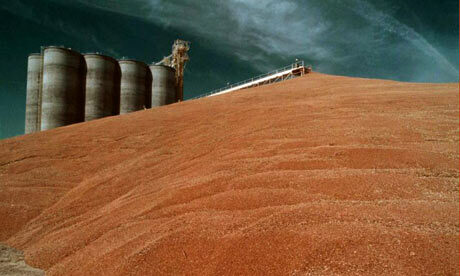 Last year 107m tonnes of grain, mostly corn, was grown by US farmers to be blended with petrol. This was nearly twice as much as in 2007, when Bush challenged farmers to increase production by 500% by 2017 to save cut oil imports and reduce carbon emissions. More than 80 new ethanol plants have been built since then, with more expected by 2015, by which time the US will need to produce a further 5bn gallons of ethanol if it is to meet its renewable fuel standard." In yet another article, scientists express concerns about the impact of nitrous oxides necessary to fertilize biofuel growth. "Scientists at the European commission have cast doubt on whether biofuels could ever be produced sustainably in significant quantities, dealing a blow to the aviation industry, which sees such fuel as a key way to reduce its emissions. The researchers argue that the greenhouse gases emitted in making biofuel may well negate most of the carbon dioxide savings made by replacing fossil fuels. Of particular concern is the uncertainty over emissions of the potent greenhouse gas nitrous oxide. Heinz Ossenbrink, of the EC's Institute of Energy (IoE), said research carried out by EU-funded scientists increasingly pointed to a long-term problem for large-scale biofuels use, namely the emissions of nitrous oxide. This is about 270 times more potent than carbon dioxide as a greenhouse gas and is released through use of fertilisers to grow biofuel crops. "Some of the older studies don't take that into account," he said. "We have now come to less positive values for biofuels." Lake Road in Far Hills is a narrow, twisting drive that was carved out of the steep slope along one side of Ravine Lake. Perched over the top of the hill on the far side is historic Blairsden. 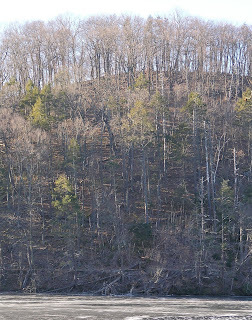 Many of the trees on these precipitous inclines are old, the terrain having made logging inaccessible. It is really sad to see how they are deteriorating. 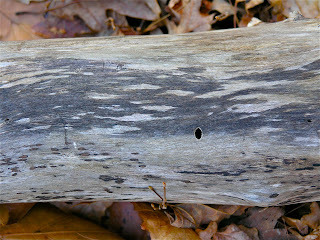 And at the foot of many trees, holes are appearing. At the northern tip of the lake is (what else?) a Lake Club, which doesn't look terribly fancy, and offers nothing but tennis and canoeing, but membership is nonetheless effectively limited to succeeding generations of local families. 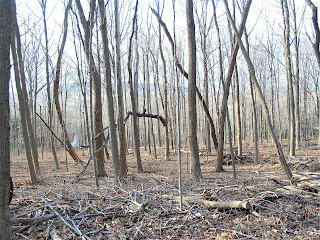 It's difficult to demonstrate in pictures how depleted these woods are. Merely being able to see through the treeline is a new event. 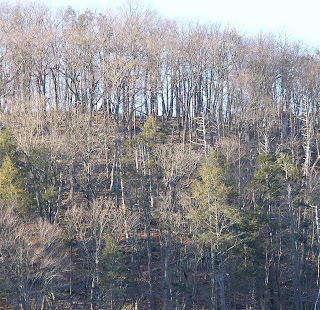 The trees are literally shrinking, disappearing, and the understory is non-existent. 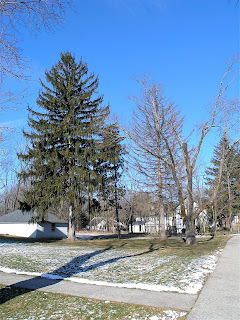 In addition, the view used to be green all year round because there are so many conifers. 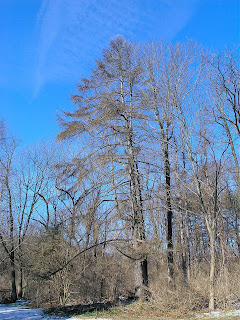 But now, all those straight white trunks are completely dead pine trees - just within the past two winters! 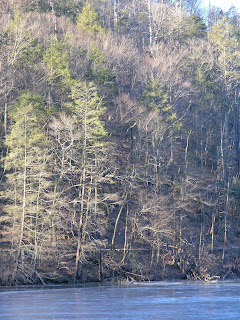 If you click on the picture you can count them up - and see that of the remaining that possess any green whatsoever, the lower branches are bare. 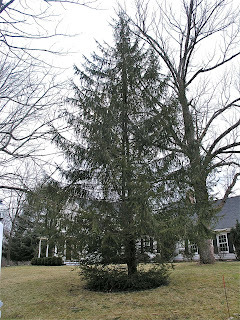 At the present rate, there won't be a single evergreen alive by this time next year. They can be found all around the water's edge. 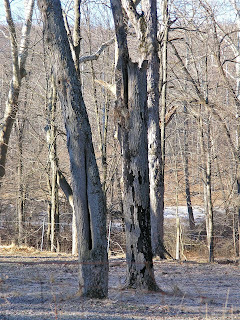 With the pines either bare or thin it is possible to discern many trees lying on the ground. 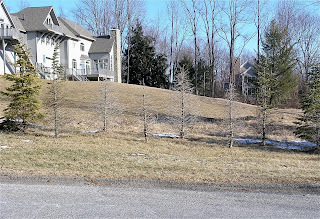 Unlike in yards or more level areas, nobody has been clearing the fallen trees and so they are indicative of the rate of loss. The dead wood slides down and then along the shore tumbles into the water. It's actually kind of scary because the road is cut so deeply into the hillside and the trees are listing threateningly over it. 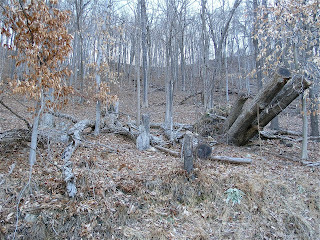 There are many root systems that have been knocked over and remain, their crowns removed with chain saws to clear passage. In the wetlands above the dam this sort of damage is ubiquitous - peeling bark and gaps in trunks. 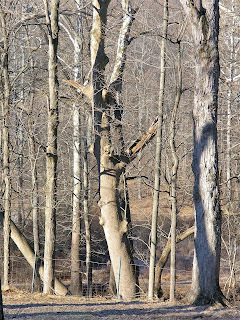 In a random sampling, we have from left to right, a toppled tree, a tree with broken branches, and a tree that is splitting apart at the top of the photo. Decline is a general term describing dieback of the branches in the crown, associated with a general reduction of tree vitality. The symptoms usually develop slowly, and may not be noticed immediately. 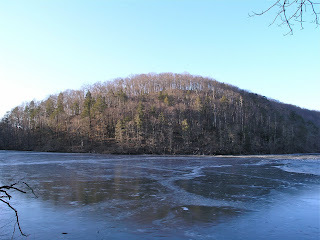 The leaves may become smaller and fewer in number. 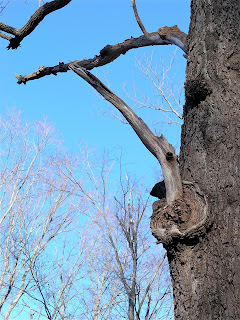 The crown of the tree often thins out. New terminal growth may be limited, and branches may die. Abnormally large seed crops are sometimes associated with decline, as is early fall color and leaf drop. 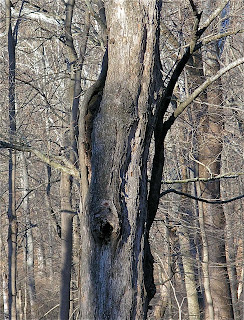 Trees affected by decline may survive for many years, or may die within a few years. 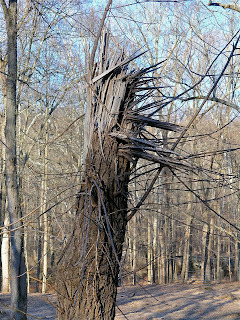 That pretty much summarizes the condition of every single tree still clinging to life in New Jersey. The example above and, closer up, below is in the process of breaking apart, about 20 feet above the ground. And the trunk will soon resemble the broken stubble depicted below, which has already lost it's top 2/3. 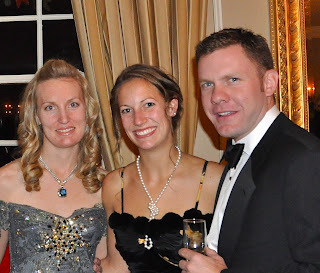 For a little escape, we splurged at the Essex Fox Hounds annual Hunt Ball. 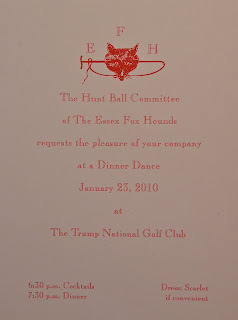 This year's event was held at Trump National. 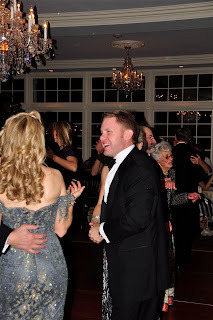 Significant Other gallantly agreed to suit up for the event. 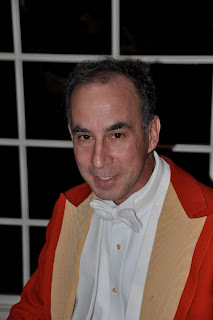 Although the dress is "Scarlet if convenient" for those with the colors. 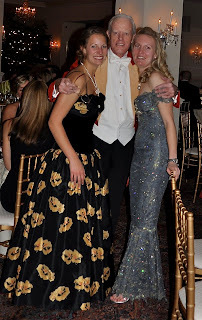 Two lovely daughters wore exquisite ball gowns. It's a time to greet old friends. 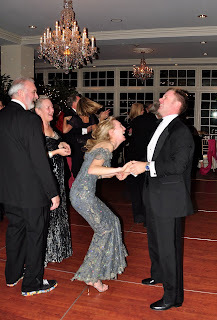 And especially, a time to laugh. Thanks to Mossy for alerting me to this film. Mossy and Roger ask everyone to go DC on April 22, Earth Day, to urge President Obama to explain to America why we must take the lead on clean energy. I plan to take Amtrak. I found this article about ocean acidification at the EPOCA blog, a comprehensive resource for links to research and news on that topic. Scientists are quickly detecting and reporting evidence of the danger of ocean acidification from CO2 absorption. Of course I care very much about the ocean. For a small part of my life I was lucky to live close enough to the beach to go to sleep listening to the surf. Snorkeling was one of the most wonderful experiences of my life. And I like to eat oysters, and I appreciate the critical role played by life in the sea, in creating oxygen and food and transport, for terrestrial life. But, I didn't grow up snorkeling in the coral reefs, I grew up climbing and admiring trees. 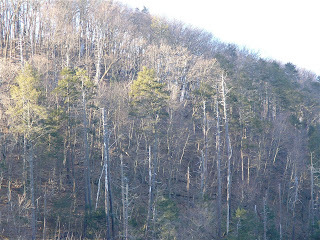 So this saga of failing seas is of even more interest to me because I see it mirrored in our failing forests. One of the scientists quoted in the article said this: "If you see these changes across an entire ocean basin, you can be assured it's happening on a global scale in other ocean basins around the world." I would quite expect this common sense statement to apply to trees being affected by toxic emissions - invisible poisons which are mixing all over earth's atmosphere just as acidification is mixing in the seas, thusly: "If you see changes across an entire forest range, you can be assured it's happening on a global scale in other forest ranges around the world." Because, Why Not? 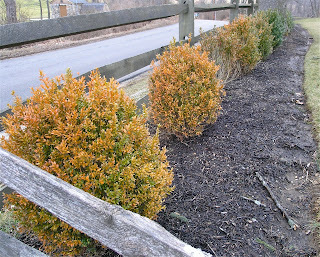 This boxwood hedge is typical of their deteriorating condition. 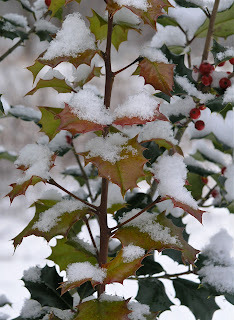 Even in winter, they should be deep glossy green, and thick with leaves. EPOCA also reports that the Center for Biological Diversity is suing the National Marine Fisheries Service for failing to respond to their petition to protect coral reefs. How I wish I could persuade somebody to sue the EPA, DEP, Forestry Dept., US Geological Service, NASA and the Dept. of Agriculture for ignoring the damage being done to vegetation from burning fossil and biofuels. All of these government agencies and not a one of them is engaged in a serious investigation. Damn them! 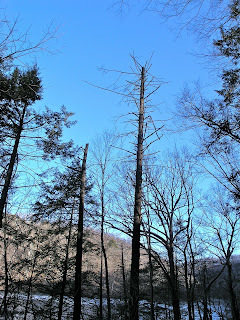 All of the coniferous trees are now thin, if not bare and dead, and all around them on the ground are broken branches. 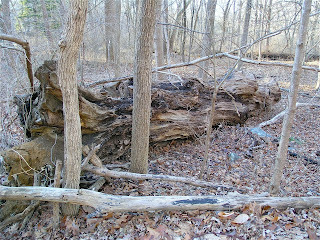 Here is a perfect example of a dead, decaying, venerably ancient trunk right next to a young, fallen sapling. It is smooth, and has no bark. 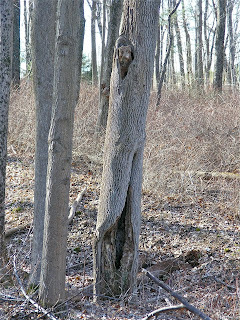 Whether in cultivated landscapes like the boxwood and pine above, or in wild indigenous settings, every single tree has damage that is sufficient to kill it in short order. 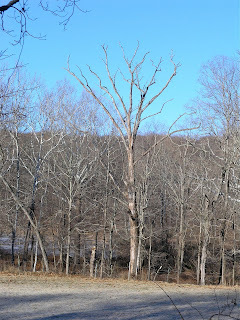 This view of a wood reminds me of the images from reports from Haiti, where the dead are so crowded in mass graves that bare limbs protrude from the burial sites. Oh, this is what I want for the children.